Two combis are better than one, and many kitchens save space by stacking one on top of the other. It gives the flexibility of two units in the footprint of one. The drawback is that the upper shelves of the top unit can be hard to reach, which may compromise safety. Meanwhile the control panel of the lower one can be awkward to operate. Plus, being two separate units means all the systems are duplicated. Now Lainox has launched the 171 – a seven grid combi mounted on top of a ten grid, contained in a single body. It delivers the flexibility of two separate units but, because it’s housed in one body, it’s shorter, and so safer, while both combis’ control panels are mounted at user-friendly heights. The 171 also costs less to buy than two separate models, and it’s easier and cheaper to install. The Lainox range is distributed in the UK by Falcon. The 171 is available in both the top of the range Naboo and the manually controlled Sapiens formats. The Naboo has very easy to use controls, a huge range of automated cooking programmes and connectivity is built in, with direct access from the tablet-style panels to the Lainox Cloud, for tips, training videos and thousands of recipes. Standard features on the Sapiens include a 2.4 inch screen and storage of up to 99 recipe programmes. 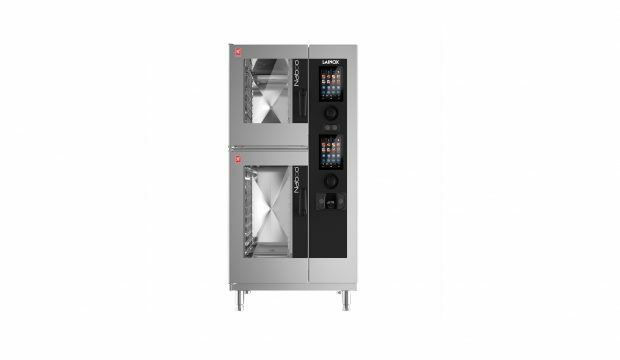 Both formats of the 171 have an autowash system for each oven and both are also available in gas and electric versions. The 171 measures 930mm wide by 825mm deep and 1925mm high. Lainox combi ovens are available through Falcon’s dealer network.